The district was approached by Howard Hopke in 2009 to begin conversations for a solution of water coming from the North through a natural channel over topping his driveway. Because it is the district's policy to wherever possible, manage water through a grass waterway vs. crossing farm fields. Wilkens proposed removing the existing culverts that are flowing west in an effort stop the water from flowing across farmland. 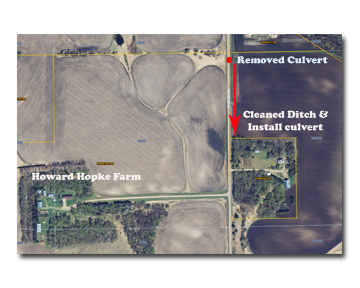 The east township ditch going south would require cleaning and a culvert placed in the dry field crossing. This solution would help aid in redirecting the water to avoid washing out the Hopke driveway. King Township supported the solution, however in 2009, after futher research this area was discovered to be out of the Sand Hill River Watershed's jurisdiction. Because of new boundary changes, the district revisied this area in 2011 helped cost share the project.